Erika, I so wish you could see in Sinclair what I see! There’s a maturity there that I have always found totally compelling. It’s a subtlety of manner that always left me wondering – knowing – that there was something so substantial underneath that made me want to know more, to see more! I’m beginning to think it may just be a matter of our age difference that makes us see things differently (not giving out actual numbers, but suffice it to say I watched Star Trek: TOS during it’s initial run). During the original B5 run, I was so upset to lose O’Hare. Even more upset more recently to find out the sad reasons behind it. I was lost on the not liking the religious aspect, especially from the writing standpoint. It seems that the other races chose their prominent religion and Sinclair, in representing earth and B5, wanted to make the point that there wasn’t one prominent religion and chose to include many of the religions on earth. And since the greeting line fades out, you get the sense that it just kept going. I would think in today’s “multi-cultural” society that would’ve been a positive point, not a negative one. Personally, I disliked that bit because it makes it seem like all religions are more or less the same. Or that all religions are equal. That is not my personal view. But within the context of the plot and also from the general writing viewpoint, it made sense. I really enjoyed this episode…except for Sinclair’s love story. I’m with Erika…not much chemistry, clunky lines. (and I LOVE a good romance, this just wasn’t.) But I love the IDEA of this person that you always have a connection with even if you can never get the timing right. I will have to go back and watch the scenes without the sound on and see if the body language works for me. 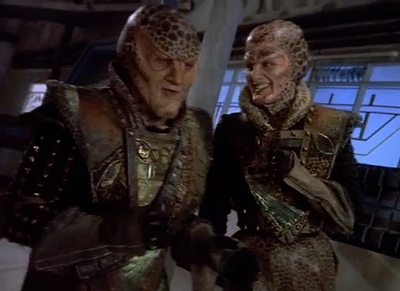 G’Kar and the pig head was awesome! And that song…in my mind it’s part of a Narn musical. And hey, Garibaldi did security stuff right! “Here minion, juggle this dagger for me.” And I was so delighted to see Lennier again. I had forgotten about him, and don’t remember anything about his story, but my heart said “Hurray!” Looking forward to getting reacquainted. Still waiting for Sinclair to be awesome, and then I can rewatch knowing what he will become. Looking forward to the next episode!